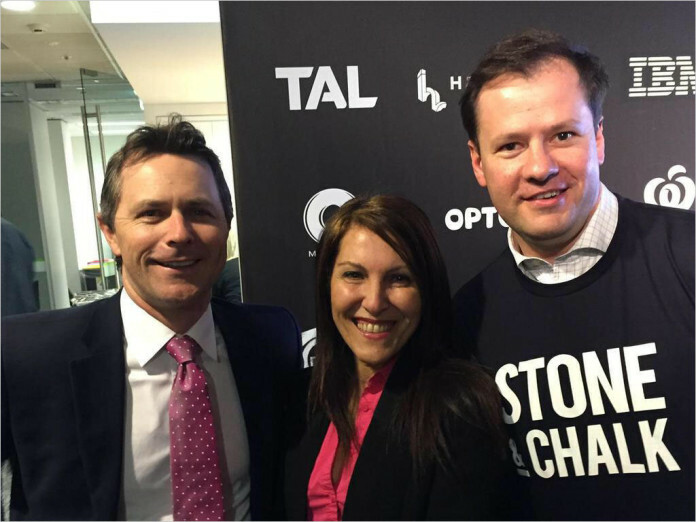 blog Sydney-based financial technology startup hub Stone & Chalk launched last night to great fanfare, with a solid wedge of politicians from both major sides of politics attending. Above we see Shadow Communications Minister Jason Clare and Shadow Parliamentary Secretary to the Shadow Treasurer, Ed Husic, flanking disruption specialist Anne-Marie Elias. Malcolm Turnbull’s Parliamentary Secretary Paul Fletcher was also there, as was Tony Abbott’s sister, Sydney City Councillor Christine Forster. And the event was opened by NSW Minister for Industry, Resources and Energy, Anthony Roberts. StartupSmart also has a nice pic featuring NSW Premier Mike Baird and former Telstra chief executive David Thodey. Stone & Chalk is a new concept for Sydney. Although the city already plays host to a number of technology startup hubs, Stone & Chalk is so far the only one to have the more specialised focus of supporting startups focused on financial technology. The facility is based at 50 Bridge Street in Sydney, and will host some 41 companies — totalling 120 people. It has about 2,300 square metres of space. Stone & Chalk is supported by the NSW Government, as well as corporate partners who made financial and professional contributions of more than $2 million to the effort. Those contributing organisations are: Allens, American Express, AMP, ANZ, Australian Stock Exchange, Capital Markets CRC, FINSIA, Finzsoft (NZ), HSBC, IAG, IBM, KPMG, Macquarie Group, Optus, Oracle, Suncorp Bank, TAL, Thomson Reuters, Veda, Westpac and Woolworths Financial Services. Stone & Chalk’s initial startup line-up spans a wide ranges of industries, from superannuation to predictive data analytics; as well as technologies, from consumer apps to crypto currencies. Companies are all at varying stages of growth, with established players such as VentureCrowd, H2 Ventures and Zetaris having taken up space alongside yet-to-launch ventures and early stage startups. You can find the full list in Stone & Chalk’s launch media release, here in PDF format. More photos from the very well-attended launch can be found on Flickr. Colour me cynical (or dumb if you prefer to be blunter), but I see little long term benefit in promoting “it might be cool for now” tech. Invest, PR, sell out. Seems to be the order of the day. Im not sure tho, Im a “loyal to company” dinosaur rather than a modern job butterfly. It just seems to lack depth. Most of the interesting stuff I see is very much industrial and not just “dload app here” stuff. Waveforms and parasitic rf. CSIRO and wifi versus myspace and soundcloud.